SNAP 2019 Exam date is December 15, 2019. SNAP exam 2019 will be held from 2PM to 4PM as a computer based test. Symbiosis International University (SIU) Pune conducts SNAP exam annually for admission to its 15 constituent Symbiosis MBA colleges. The SNAP 2019 exam registration opens in the last week of August. The last date to apply for SNAP 2019 is the last week of November 2019. SNAP exam full form is Symbiosis National Aptitude Test. 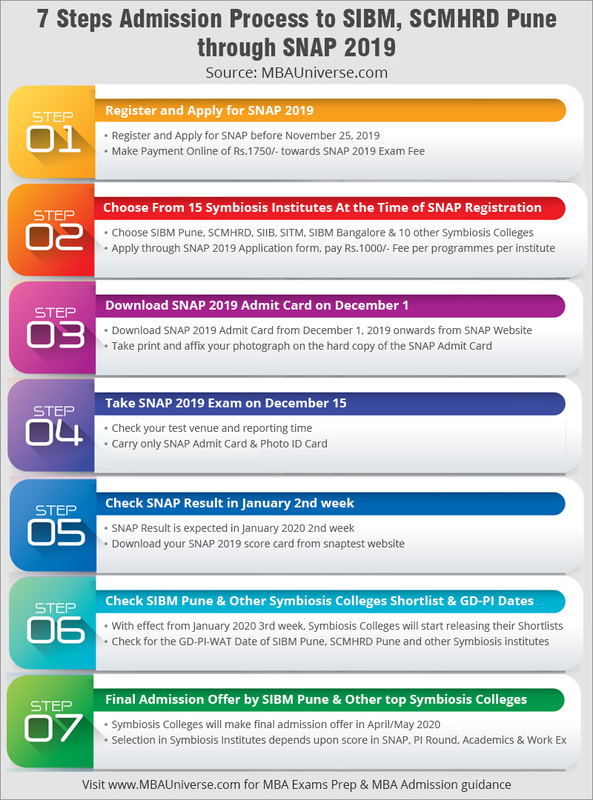 SNAP 2019 exam Admit Card is available for download till the SNAP 2019 exam date and is to be downloaded from SNAP 2019 website. The SNAP exam pattern has changed. Now the SNAP exam 2019 will consist of 110 MCQs and 20 Non-MCQs with 25% negative marking. As revealed with the SNAP exam full form, Symbiosis National Aptitude Online Test - SNAP 2019 is the common, mandatory MBA entrance test for admission to all the 15 Symbiosis Institutes affiliated to Symbiosis International University (SIU) Pune. The list of SNAP score accepting colleges includes some of the top MBA colleges in the country like Symbiosis Institute of Business Management (SIBM) Pune which is ranked among top 20 management institutes in MHRD-NIRF Ranking 2019. SNAP Exam 2019: What Has Not Changed? No Change in Maximum Marks which remain 150. Traditionally, SIU Pune has kept the SNAP Exam Date as third Sunday of December every year and going by this trend the SNAP 2019 date of exam is December 15. The test cities for SNAP exam 2019 are reduced to 92. How to Apply for SNAP Exam 2019? SNAP 2019 application process starts in the last week of August 2019. The last date to apply for SNAP is November 25, 2019. You can register for SNAP 2019 online on the official SNAP 2019 Exam website and can pay the SNAP exam fee of Rs.1750/- either online or through Demand Draft. The SNAP 2019 exam registration fee includes the fee for SNAP exam application form and for registration. How to Prepare for SNAP Exam? How to prepare for SNAP in 6 months, 3 months or 2 months? Solve SNAP Previous Test papers & Mocks: How to attempt and analyse? Gateway to 15 Symbiosis MBA colleges: SNAP 2019 is the only exam, the scores of which are accepted by all the 15 Symbiosis institute across the country for MBA admission. Some of the top MBA colleges accepting SNAP test scores are SIBM Pune, SCMHRD Pune, SIIB Pune, SIBM Bangalore among others. Moderate Difficulty Level: SNAP 2019 exam is a moderate difficulty level test with 110 MCQs and 20 Non-MCQ divided in four core sections of General English; Quantitative, Data Interpretation and Data sufficiency; Current Affairs; Analytical & Logical Reasoning. The duration of the exam is 2 hours. No Sectional Cutoff: SNAP Test scores are declared out of 150 marks scaled down to 50. It does not have sectional cut off. So it offers you the opportunity to play on your strength be it Quants, LR/DI or English and maximize the score. However, qualifying score in each of the 4 sections has to be obtained. Leads to University MBA degree: All the SNAP exam accepting Symbiosis institutes are affiliated to Symbiosis International University (SIU) Pune and as such award University MBA degree which is recognized worldwide. SNAP, Similar to CAT, XAT, CMAT, NMAT: SNAP 2019 exam will be an online computer-based test on the pattern of CAT, XAT, CMAT, NMAT. As per the past trends, it is expected that SNAP 2019 will have lower difficulty level than CAT and XAT and similar difficulty level with NMAT and CMAT. Single day, Single session exam: SNAP 2019 Exam is a single day, single session exam of two hours duration which does not require equating the scores as per the difficulty level across different sessions and the merit list is prepared straight forward like XAT and CMAT. Low Cost Exam: SNAP is the low cost MBA entrance exam as it provides admission opportunity in 15 Symbiosis B-schools with the SNAP registration and application fee of Rs.1750/-. SNAP exam, SNAP Registration and SNAP exam application fee taken together comes to little above than Rs.100 per Symbiosis MBA college. Simplified Application Process: You can apply to Symbiosis Institutes through SNAP Application Form. Aspirants can now apply for the programmes in each Symbiosis Institute through the SNAP exam portal by paying the Institute application fee of Rs.1000/- per programme. Symbiosis National Aptitude (SNAP) Test is an important National Level MBA Entrance test for MBA admission in 15 Symbiosis MBA colleges accepting SNAP 2019 score. It is considered as one of the major entrance exams after CAT and XAT. Thousands of MBA aspirants will register and apply and will test their skills on SNAP 2019 Exam Date on Sunday December 15, 2019 for admission to various Symbiosis institutes. Symbiosis International University (SIU) Pune, the authority which conducts Symbiosis National Aptitude Test (SNAP) exam, will release the SNAP 2019 Notification in last week of August 2019. MBAUniverse.com will continue to update this page to highlight latest dates and other exam announcements. So bookmark this page for your SNAP 2019 exam preparation. SNAP 2018 Eligibility Criteria comprise two major Eligibility requirements – the first one is the eligibility criteria to appear in SNAP 2018 exam on December 16, 2018 and the other one is the individual eligibility criteria for admission to 15 Symbiosis Institutes. Symbiosis International University (SIU), Pune has announced the SNAP 2018 Eligibility Criteria and the eligibility criteria to apply for admission in each of the 15 Symbiosis Institutes. SNAP 2018 Registration and application process closes on November 28, 2018. The last date of SNAP registration has been extended to Nov 28 from earlier Nov 26, 2018. You can register for SNAP 2018 online on the SNAP 2018 Exam website and can pay the SNAP exam fee of Rs.1750/- either online or through Demand Draft. The SNAP 2018 exam registration fee includes the fee for SNAP exam application form and for registration. SNAP 2018 Admit card is live now on Snaptest.org website. The SNAP Admit Card download is available till SNAP exam day on December 16, 2018. Symbiosis International University (SIU) Pune has released the SNAP 2018 hall ticket on Saturday, December 1. If you have not completed the SNAP 2018 Admit card download, complete it immediately without delay. Please note to carry the SNAP Admit Card to the SNAP exam centre alongwith the photo ID proof. SNAP Answer Key 2018 are live now! Symbiosis University has released the Official SNAP 2018 Answer Key on December 19, 2018. Official SNAP 2019 Question Paper is also available with your login ID and Password at SNAP website. SNAP Objection Form is also available incase you want to dispute answer to any question. You can check the SNAP Answer Keys by following simple steps explained below. However, unlike CAT where IIM Calcutta had released CAT 2018 Response Sheet for each candidate, SNAP hasn’t published a candidate’s responses/answers. On December 16, 2018, Symbiosis International University (SIU) Pune will conduct SNAP 2018 Online Computer Based SNAP Test. Symbiosis National Aptitude Test (SNAP) 2018 is to be held in 92 test cities in India for admission to MBA 2019-21 in 15 Symbiosis Management institutes including SIBM Pune. To help SNAP 2018 aspirants prepare better in the changed online SNAP exam structure, experts at MBAUniverse.com have prepared SNAP Previous test papers with answer keys. SNAP 2018 Result is out! Symbiosis International University (SIU) Pune has declared SNAP 2019 exam result with SNAP card on January 10, 2019 at 4 PM. The SNAP score card is live for download from SNAP official website. To know how to download SNAP 2018 score card follow the steps shared below. With the declaration of SNAP exam result, all the 15 Symbiosis Institutes will start shortlisting students for final selection process individually. SIU had earlier announced to declare the SNAP 2018 Result in the 2nd week of January 2019. SNAP 2018 Exam date is December 16, 2018. SNAP has gone online with the test duration of 2 hours from 2PM to 4PM. SNAP is considered a lengthy exam with 150 questions with 4 sections and carrying individual sectional cut offs and to be solved in 2 hours time. SNAP Exam 2018 result has been declared on January 10, 2019 at 4 PM. SNAP 2018 exam scores will lead to MBA admission 2019 in 15 Symbiosis institutes. You can download your SNAP 2018 score card from official SNAP website.